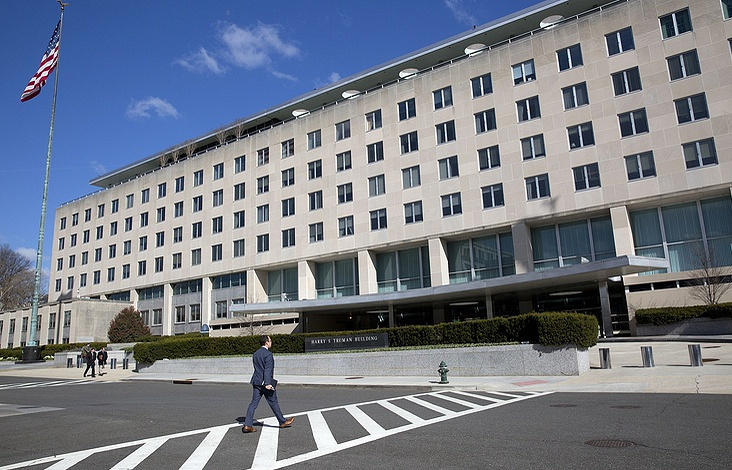 Nauert dismissed reports that a chemical weapons provocation is being staged by militants in Idlib as "false flag reporting"
WASHINGTON, August 30. /TASS/. The United States are concerned about the possibility of any kind of offensives in the Syrian province of Idlib and have informed Russia about this, US Secretary of State spokesperson Heather Nauert has told reporters. "I think what we are concerned about is not just a potential chemical weapons attack, but we’re concerned about the threat, any kind of escalation of violence in Idlib. That would put civilians and civilian infrastructure in Idlib at risk," Nauert said when asked to comment on the possibility of an offensive in Idlib. "We have shared the concerns that we have about any potential offensive taking place," she added. "We’ve shared those concerns with the Russian Government at many levels, from Secretary Pompeo to his counterpart, to Chairman Dunford, also to Secretary Mattis, National Security Advisor Bolton and others." Nauert dismissed reports that a chemical weapons provocation is being staged by militants in Idlib as "false flag reporting." "We’ve seen that before," she said. "They try to put the blame, they try to put the onus on other groups, and we don’t buy into that." Russia’s US ambassador, Anatoly Antonov, met with Assistant Secretary of State (Acting) for Near Eastern Affairs David Satterfield and United States Special Representative for Syria Engagement James Jeffrey on Monday, August 27. Commenting on the meeting, Nauert said that Antonov, Satterfield and Jeffrey discussed the situation in Syria "with a particular focus on U.S. indications of an impending Syrian regime offensive. "So that’s obviously supported by Russian forces and Iranian forces, and that is something that is of concern to them and to us," she said. "We’ve seen the reports about that and of course we’re concerned, concerned about the potential impact on civilians and also infrastructure as well, in a country that has been through so much," Nauert continued. "We’re concerned about it. I mean, you’ve seen the - you’ve read the Russian reports, you’ve heard their rhetoric, and so we’re concerned about what could potentially happen." "We have all seen what the Syrian regime, backed by the Russian Government, has done in the past. That should not be a surprise to anyone that that would be a concern of ours once again," she added. Russian Foreign Minister Sergei Lavrov said on Wednesday that terrorists in Idlib are trying to hold civilians hostage to be used as human shields and this festering ‘abscess’ has to be eliminated. Moscow stands for urgently separating the opposition from Jabhat al-Nusra (a terrorist organization outlawed in Russia) in Idlib and simultaneously carrying out an operation against the terrorists, he added. At their negotiations on August 24, Russian Foreign Minister Sergey Lavrov and his Turkish counterpart Mevlut Cavusoglu hashed over the situation in Idlib. Despite the absence of an unambiguous accord on ways to achieve peace in the province, the foreign ministers stated the common goal of rooting out this terrorist hotspot. Russian President Vladimir Putin and his Turkish counterpart Tayyip Erdogan will discuss the Idlib situation soon focusing on separating the opposition from terrorists.